Unit revenue growth is now set to come in at the bottom of Delta's forecast range for the fourth quarter. But that still sets the stage for double-digit earnings growth in 2019. Check out the latest Delta earnings call transcript. Investors continue to be extremely skittish about the possibility of a slowdown in revenue per available seat mile (RASM) growth at any U.S. airline. Yet there's no sign that Delta is about to start reporting outright declines in its unit revenue -- and a sharp drop in oil prices over the past three months represents a huge earnings tailwind for the coming year. Back in October, Delta reported that RASM rose 4.3% year over year in the third quarter, adjusted for the impact of Delta's oil refinery. Management projected that demand trends would remain strong in the fourth quarter, driving a 3% to 5% increase in RASM. Delta posted strong unit revenue growth for most of 2018. Image source: Delta Air Lines. In early December, the company updated its guidance, saying that RASM was on track to rise 3.5% for the quarter. Nevertheless, Delta told investors that earnings per share would likely come in "at the high-end of the company's $1.10-$1.30 guidance range" due to a sharp decline in fuel prices that began in October. In its recent investor update, Delta Air Lines said that it now expects to report RASM growth of 3% rather than 3.5% for the fourth quarter. The company said that the demand environment remained healthy throughout the quarter, but that the pace of improvement in fares for last-minute travel slowed in December. Top-line growth will still be quite strong at 7% (excluding refinery sales), and EPS is on track to reach $1.25-$1.30, in line with the early December guidance update. But that wasn't enough to appease investors, who sent Delta Air Lines stock plunging to a 52-week low. Delta Air Lines Stock Performance, data by YCharts. In the fourth quarter, Delta benefited from a roughly 0.5% year-over-year decline in nonfuel unit costs, as well as fuel prices that came in $0.10 per gallon lower than initially expected. Yet its average fuel price was still up nearly 25% year over year last quarter. By contrast, the price of jet fuel is now lower than it was at this time last year -- and significantly lower than the average price for 2018. As a result, Delta's fuel costs are on track to drop this year. Additionally, fuel efficiency improved more than 1% in the first nine months of 2018. The pace of improvement may have accelerated last quarter, as Delta has retired a bunch of its fuel-guzzling MD-88 jets since the end of the summer peak season. Lastly, Delta expects nonfuel unit costs to rise just 1% in 2019. Consequently, barring a sharp rebound in fuel prices, Delta Air Lines could grow its earnings next year even if unit revenue were to remain flat. If Delta meets the 2019 outlook it provided at last month's investor day -- which implies 1% to 3% RASM growth -- it would post even stronger earnings growth. In fact, Delta's initial 2019 guidance calls for adjusted EPS between $6 and $7, up from an expected $5.59 in 2018. That forecast assumes oil prices at more than 10% above current levels. Furthermore, the carrier's 1% to 3% RASM growth guidance indicates that management was already expecting unit revenue trends to moderate from the 4%-plus growth pace set throughout most of 2018. Even after bouncing back somewhat on Friday, Delta Air Lines shares trade for just over seven times the midpoint of the company's 2019 EPS guidance range. This makes the stock look like a huge bargain, especially given that Delta's guidance incorporates conservative assumptions for fuel prices and unit revenue growth. So far, most airlines are planning to slow their capacity growth this year, relative to 2018. That provides a favorable industry backdrop for continued unit revenue growth, albeit slower than the pace seen last year. 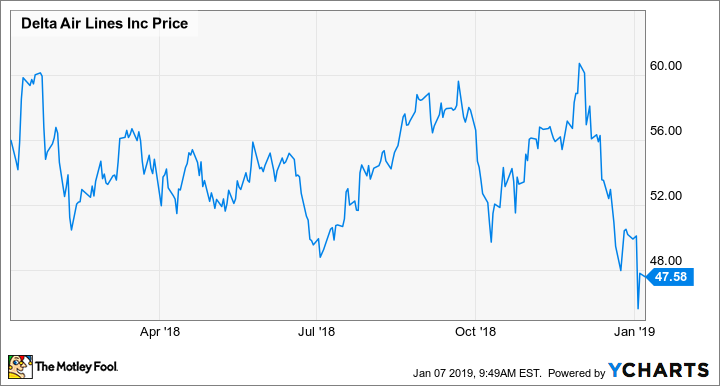 As long as fuel prices remain moderate and unit revenue keeps growing -- even just a little bit -- Delta Air Lines stock is likely to rebound later this year.